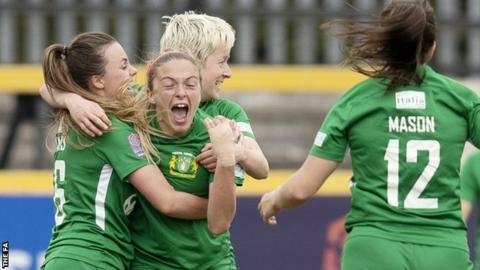 Yeovil Town delayed confirmation of their Women's Super League relegation with victory at nearest rivals Everton. A 10-point deduction imposed on Yeovil in midweek left them all but assured of the drop. Megan Alexander, who earlier hit the post, scored the game's only goal with a cross that deceived the goalkeeper. Megan Finnigan hit the post minutes earlier for Everton, whose safety will be assured with a point or if Yeovil fail to win all their remaining games. The dramatic win came just three days after it announced that Yeovil had been deducted points, with the Football Association saying the club had "lodged a notice of intention to appoint an administrator". Before the emotional triumph, Yeovil had won just once all season - beating Everton by the same score in the reverse fixture in November. Yeovil have said an advance of next year's funding from the FA would allow them to complete the WSL season and mean there was "no necessity for any further formal insolvency process to continue". A further statement on Saturday reiterated that they had not gone into administration, while also laying out their plans for the future. The Glovers plan to revert to part-time status in the Championship next season and hope that, with the support of local businesses and sponsors, they can build a sustainable club that could one day return to the top flight. On the field, Yeovil have struggled once more after a difficult 2017-18 campaign in which they failed to win any of their 18 league games last season and scored only two goals. However, the Somerset club kept their spot in the WSL because of the league's restructure, successfully applying for a licence and going full-time last summer. Match ends, Everton Ladies 0, Yeovil Town Ladies 1. Second Half ends, Everton Ladies 0, Yeovil Town Ladies 1. Attempt blocked. Chantelle Boye-Hlorkah (Everton Ladies) right footed shot from outside the box is blocked. Assisted by Georgia Brougham. Bonnie Horwood (Yeovil Town Ladies) wins a free kick in the defensive half. Delay in match Megan Walsh (Yeovil Town Ladies) because of an injury. Attempt saved. Inessa Kaagman (Everton Ladies) header from the centre of the box is saved in the top centre of the goal. Assisted by Hannah Cain with a cross. Attempt blocked. Hannah Cain (Everton Ladies) right footed shot from outside the box is blocked. Assisted by Angharad James. Attempt blocked. Angharad James (Everton Ladies) left footed shot from outside the box is blocked. Assisted by Chantelle Boye-Hlorkah. Delay in match Emily Donovan (Yeovil Town Ladies) because of an injury. Hand ball by Emily Donovan (Yeovil Town Ladies). Foul by Abbey-Leigh Stringer (Everton Ladies). Foul by Taylor Hinds (Everton Ladies). Emily Donovan (Yeovil Town Ladies) wins a free kick in the defensive half. Substitution, Yeovil Town Ladies. Amber Gaylor replaces Ann-Marie Heatherson because of an injury. Delay in match Ann-Marie Heatherson (Yeovil Town Ladies) because of an injury. Attempt missed. Rachel McLauchlan (Yeovil Town Ladies) right footed shot from outside the box is too high. Assisted by Emily Syme following a fast break. Hand ball by Nicola Cousins (Yeovil Town Ladies). Megan Finnigan (Everton Ladies) wins a free kick in the defensive half. Foul by Rachel McLauchlan (Yeovil Town Ladies). Goal! Everton Ladies 0, Yeovil Town Ladies 1. Megan Alexander (Yeovil Town Ladies) left footed shot from long range on the left to the high centre of the goal. Taylor Hinds (Everton Ladies) wins a free kick in the defensive half. Foul by Emily Donovan (Yeovil Town Ladies). Corner, Everton Ladies. Conceded by Rachel McLauchlan. Attempt missed. Inessa Kaagman (Everton Ladies) right footed shot from outside the box is too high. Assisted by Georgia Brougham following a set piece situation. Substitution, Yeovil Town Ladies. Emily Syme replaces Olivia Fergusson. Georgia Brougham (Everton Ladies) wins a free kick on the left wing. Foul by Ann-Marie Heatherson (Yeovil Town Ladies). Attempt blocked. Chantelle Boye-Hlorkah (Everton Ladies) right footed shot from the centre of the box is blocked. Assisted by Hannah Cain with a cross. Attempt missed. Megan Finnigan (Everton Ladies) header from the centre of the box is too high. Assisted by Angharad James with a cross following a corner. Corner, Everton Ladies. Conceded by Bonnie Horwood. Attempt saved. Megan Finnigan (Everton Ladies) header from the left side of the six yard box is saved in the bottom left corner. Assisted by Angharad James with a cross. Corner, Everton Ladies. Conceded by Hannah Short. Substitution, Everton Ladies. Megan Finnigan replaces Gabrielle George because of an injury.